Scientists are starting to consider the notion that whales might have a pretty cool culture. It looks as though Herman Melville picked the right hero for his epic novel. "Whales are pretty hard to study, but evidence is coming up from quite a number of species that in a whole range of ways, they're learning things from each other and they're passing it on to other whales, and that's culture," says Hal Whitehead, biology professor at Dalhousie University in Nova Scotia, Canada. Whitehead says whales don't have opposable thumbs, so they can't craft material objects to pass on through the generations: "Whale cultures are in their minds and not in the things that they make." "Whale culture has, like human culture, a range of types and styles," says Whitehead. "At one end, there are the fast moving what might be called 'pop' cultures, such as when male Humpback whales sing songs to attract females or ward off other males. "These songs evolve, so that at the beginning of the breeding season they're all singing one song and then it's changed a bit by the end," says Whitehead. "And after a couple of years they're singing a totally different song." But other whale languages are more constant and enduring. The dialects of killer whales, which travel in large extended-family groups called pods, "seem to change much more slowly and to be linked to particular social structures," says Whitehead. "A particular pod will have its own dialect, and that dialect will be similar to pods which are the members of the same clan, and clans will have dialects which are different from one another—just as humans from different parts of the same country may sound a bit different, but humans from different countries may be totally unintelligible to each other," says Whitehead. And these dialects will be stable. 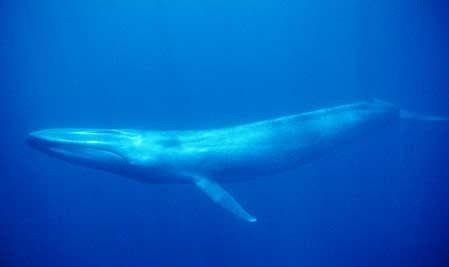 "In sperm whales which we study, we can record a group of sperm whales now, we can record them ten years from now, and we won't notice any difference in the sounds they're making." Whitehead notes that different pods of whales can have distinctly different sets of behaviors and languages even though they share territory. "We find this situation where we have multi-cultural societies," he says. "In one place, there are animals who make their living in very different ways." Sperm whales off the Galapagos islands have two distinct ways of speaking. These whales speak in a series of clicks, but some of them often add a pause and a final "click." Where this is important, says Whitehead, is that depending upon the weather, one group may survive better than the other. He notes that the whales with the last click accent seem to thrive in El Nino years, when the water is much warmer, while the group without the accent prefers the colder waters of normal years. Sperm whale clans appear to have distinct cultures and dialects. Some of these clans are itinerant, traveling great distances in short periods of time; others appear to be sedentary, remaining in one place for days. Whitehead transcribes the variation in vocalizations between clans. Group A: "Click-Click-Click-Click-Click," Group G "Click-Click-Click-Click-pause-Click," Group T "Click-Click-pause-Click-Click." These codas are preserved across the ocean and over time, each repertoire "a group property." Cultural inheritance in sperm whales is not only observed in their clicks and pauses but also in the variation in foraging patterns, synchronized dives, even defecation rates. To Whitehead, clan identity is similar to nationality in humans. Membership in a dominant clan can increase the chances of survival and of reproduction. Why did the song change? It's not clear, but what is clear is that whales have a sophisticated culture. And who knows, it may be a culture that provides them with the tools to outlive that of homo sapiens. The fact that they took the opposite revolutionary route of human's by going from land to sea 50 million years ago.was a stroke of genius. After all, this the water planet. As evolutionary biologist Neil Shubin points out, "In one sense, evolution didn't invent anything new with whales. It was just tinkering with land mammals. It's using the old to make the new." The Daily Galaxy via Natural Sciences and Engineering Research Council of Canada.